Boeing and SpaceX hope to launch commercial crew ferry ships on long-awaited test flights later this year, but both companies face major challenges getting the spacecraft certified before late 2019 when seats aboard Russian Soyuz spacecraft will no longer be easily available for NASA space station crews, officials told lawmakers Wednesday. And whenever they do eventually fly, the companies may not be able to meet NASA's stringent flight safety requirements. The agency wants the new spacecraft to have only one chance in 500 of losing a crew during ascent and entry, and an overall 1-in-200 chance of fatalities due to a spacecraft issue during a 210-day mission to the station. "The panel has been monitoring the providers' progress in working toward the LOC (loss of crew) requirements, and it appears that neither provider will achieve 1-in-500 for ascent/entry and will be challenged to meet the overall mission requirement of 1-in-200," Patricia Sanders, chairman of NASA's Aerospace Safety Advisory Panel, or ASAP, told the House Subcommittee on Space. Since the end of the space shuttle program in 2011, NASA has relied on the Russian Soyuz spacecraft to carry astronauts to and from the space station at more than $80 million a seat under the most recent contract. But in 2014, NASA awarded commercial crew contracts to Boeing and SpaceX to end the agency's sole reliance on the Russians. 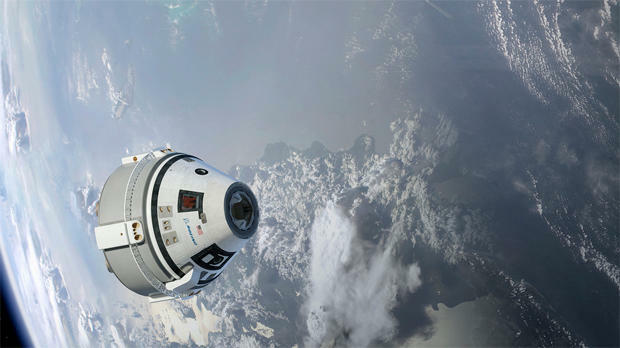 Boeing won a $4.2 billion contract to develop the CST-100 Starliner capsule while SpaceX won a separate $2.6 billion to build its Dragon crew craft. Both companies initially promised test flights in 2016 and 2017, but funding shortfalls in Congress slowed development. Boeing now hopes to launch the first Starliner spacecraft atop an Atlas 5 rocket on an unpiloted test flight in late August, following by a crewed demonstration flight in November. SpaceX has a similar schedule for its new Dragon crew ship, which will launch from the Kennedy Space Center atop an upgraded version of the company's Falcon 9 booster. NASA managers hope to certify the spacecraft for routine, operational crew ferry flights to the International Space Station early in 2019, well behind schedule because of earlier delays. Hedging its bets, the agency secured seats aboard Soyuz spacecraft through 2019. But that is the end of the road for routine flights aboard the Russian ferry ships. Bill Gerstenmaier, director of spaceflight operations at NASA, said it takes three years to build a Soyuz and given station operations are currently only planned through 2024, there are no plans to purchase any additional seats from the Russians. Cristina Chaplain, a senior manager at the Government Accountability Office, told lawmakers the current target for commercial crew certification is highly uncertain due to the amount of work remaining. "While Boeing and SpaceX are making significant progress, both continue to experience schedule delays," she said. "It's been three weeks since the program's original December 2017 goal to secure domestic access to the space station. Yet neither contract has yet to conduct a test flight. "In fact, final certification dates have slipped to the first quarter of calendar year 2019 and we found that the program's own analysis indicates that certification is likely to slip into December 2019 for SpaceX and February 2020 for Boeing." She said it's not unusual for advanced technology programs to experience delays, especially in a program that requires new human-rated spacecraft to operate with safety margins significantly higher than the space shuttle's. But frequent delays "and uncertain final certification dates raise questions about whether the U.S. will have uninterrupted access to the space station beyond 2019," she said. "NASA may have to purchase additional Soyuz seats, but as Mr. Gerstenmaier mentioned, there are limits to how it can do so." "Significant challenges to safety and reliability"
Space Subcommittee Chairman Brian Babin, R-Texas, opened the two-hour hearing by saying SpaceX and Boeing "may not meet safety and reliability requirements and could even slip into cost overruns." "Both companies are making progress, but certainly not at the rate that was expected, and not without significant challenges to safety and reliability," he said. "In order to remedy these problems, NASA may seek additional funding or accept significant risk. Neither of those options is viable." Gerstenmaier agreed the program faces challenges, but he said NASA is working closely with Boeing and SpaceX to mitigate risks and representatives of both companies insisted they will be ready for initial test flights this summer with the first crewed test missions before the end of the year. All said crew safety is the top priority. "The NASA team is fully aware of the amount of work to go and the requirements that need to be completed, reviewed and closed by NASA and its partners," Gerstenmaier said. "NASA's been fully engaged with the partners during their design and testing and manufacturing processes. NASA's aware of the schedule, but not driven by the schedule." SpaceX came under more scrutiny from lawmakers than Boeing, presumably because SpaceX's Falcon 9 rocket has suffered two catastrophic failures, one during a flight in 2015 and the other during a launch pad test in September 2016. United Launch Alliance's Atlas 5 has flown 74 successful missions in a row since the booster's maiden launch in 2002. Lawmakers questioned NASA's insight into the rocket's Russian-built RD-180 first-stage engine, but Gerstenmaier said the agency was working to achieve that. No other Atlas-related questions were raised. The causes of SpaceX's two failures, and its plans to load astronauts on board before the Falcon 9 is loaded with propellants, drew repeated questions. SpaceX's first failure, in June 2015, destroyed a Dragon cargo ship bound for the International Space Station. The mishap was blamed on a defective strut in the rocket's second stage liquid oxygen tank that apparently fractured or broke away, releasing a high-pressure helium tank that was immersed in the oxygen. The helium vessel then shot up to the top of the oxygen tank, triggering the failure of the second stage. Flights resumed the following December using a new technique to increase booster performance using rocket propellants that are chilled below the temperatures employed by other rockets. The upgraded Falcon 9 uses colder-than-normal RP-1 kerosene fuel and super-cooled, or "densified," liquid oxygen loaded just 35 minutes before launch. The helium tanks, known as carbon composite overwrap pressure vessels, or COPVs, are submerged in the oxygen and subjected to those ultra-low temperatures. SpaceX reeled off nine successful flights in a row using densified propellants before a spectacular Sept. 1, 2016, on-pad explosion that destroyed another Falcon 9 and a $200 million communications satellite. That failure also involved the second stage helium pressurization system. SpaceX engineers were never able to pinpoint a "root cause," but eventually concluded the most likely scenario involved possibly frozen oxygen propellant trapped between the aluminum skin of a helium tank and its insulating carbon fiber overwrap. After extensive testing, "SpaceX modified its helium loading configuration, process and controls to ensure that the COPVs would not be exposed to these identified conditions and, accepting any residual risk, successfully resumed commercial launches with the existing COPV design," Sanders said. "However, to further improve safety, SpaceX and NASA agreed that a redesign of the COPV was necessary to reduce the risk for missions with crew on board," she added. A "rigorous" test program is underway and "the panel considers this to be the most critical step in clearing the COPV for human space flight." To use densified liquid oxygen, the super-cold propellant must be loaded just before launch. For piloted Dragon missions, that means the astronauts must be strapped in before liquid oxygen loading begins, a strategy known as "load and go." Many veteran rocket engineers have questioned the safety of that procedure, but Hans Koenigsmann, vice president of flight reliability at SpaceX, said it improves the Falcon 9's performance and at the same time enhances crew safety. "We try to minimize the time we expose personnel, not just astronauts but also (ground) crew, to the hazard of fueling," he said. "We strap them in, we make sure they're comfortable and then the ground crew retreats and we arm the pad abort system and then we start fueling the main propellants. It's a relatively quick procedure, and we believe this exposure time is as short as possible and, therefore, the safest approach." And in any case, he said, the Dragon's already-tested abort system would have saved a crew from an in-flight failure like the one in 2015 and it likely would have pulled a crew to safety in a rapid on-pad explosion like the most recent mishap. John Mulholland, vice president and program manager of Boeing's Starliner program, said the ASAP "appropriately has significant concerns" over the use of densified propellants. "Using this type propellant is something we considered years ago in the space shuttle program when we were looking for additional performance capability, but we never could get comfortable with the safety risks. When you're loading densified propellant, it's not an inherently stable situation." But Koenigsmann disagreed, saying earlier that liquid oxygen loaded in more traditional fashion is always boiling off and must be constantly replaced. "Some people say it is quiescent, but it's actually a constantly boiling process that needs to be refilled from the other side," he said. "So we don't consider that as a really quiescent stage, either." Gerstenmaier said NASA engineers are studying the "load and go" procedure and "we'll make an informed decision about when, for this particular rocket's design, is the safest time to put the crew (on board)."